Indiana - Land of Lincoln? — Geoff Wood, coworking guy. Indiana - Land of Lincoln? A ceremony will be held Thursday in Dale to unveil new highway signs that identify Indiana as "Lincoln's Boyhood Home." The new signs will be attached to existing “Indiana-Crossroads of America Signs” at the state's borders. President Abraham Lincoln lived in Spencer County from age 7 to 21. Governor Mitch Daniels will attend the unveiling ceremony. Odd. I thought that Illinois got the credit for the Great Emancipator, after all he was a resident there when he pulled off his miracle candidacy - on the subject of his political career, I quite enjoyed the biography "Team of Rivals" which I read, er, listened to on my ipod, this Spring - and subsequent election 100+ years ago. Back to Illinois, isn't "Land of Lincoln" their motto? I certainly remember seeing it on license plates(2) for most of my life. I feel like a bit of a follower playing off their slogan to have a reason to stake a claim in Mr. Lincoln. Maybe, I shouldn't - when driving back from Nashville a couple weeks ago I noticed that Kentucky has already beat us to such a sign. We'll be followers two-fold. I wonder what it takes to get your name somewhat-permanently emblazoned in every location you ever lived. What would I have to do to get a sign in Tennessee claiming "Birthplace of Wood"? How about water towers in Cedar Rapids and Des Moines saying "Childhood Homes of Wood"? 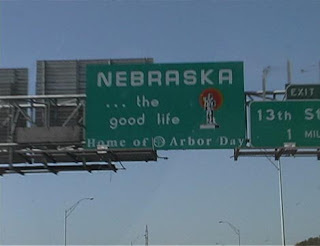 Perhaps an addition below this "Home of Arbor Day" claim on the Missouri River bridge into Omaha that says "Wood Lived Here for 6 Months After College Before Moving Back To Iowa". Is it just being President? That's potentially attainable, however unlikely(3). Nah, I s'pose that doesn't guarantee it. I don't think New York State has a "post-presidential home of William Jefferson Clinton" sign at every border. Perhaps it has to be "really big" like save a splintered nation and freeing an entire race of enslaved people. I'd imagine that would do it...I'll get to work (after dinner). (1) I like to be informed of the goings-on in the Hoosier business community, it makes for thrilling watercooler talk. (2)License plate verbage appears to be the most appropriate use of a state motto. (3)This can be my backup, I still have 7 years before I'm eligible.